Much of the attention being given to President Donald Trump’s visit to the Middle East has focused on whether his first foreign trip will provide much of a distraction from his growing domestic troubles. But the real substance centres on his plan to solve a problem that has eluded all of his predecessors: the conflict between Israel and the Palestinians. 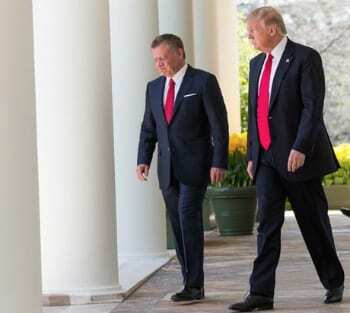 President Donald Trump (right) and King Abdullah II of Jordan at the White House April 5, 2017. Credit: Shealah Craighead/White House. their ties with Israel so long as the Palestinians still seek the Jewish state’s destruction to the cheers of the Arab street. Still, Trump’s effort is not based entirely on the delusions that led Obama to believe pressure on Israel would convince the Palestinians to meet him halfway. As The Wall Street Journal reported, the Saudis and other Gulf nations are putting forward a scheme in which they would make strides toward normalising relations with Israel in exchange for Netanyahu enacting a partial settlement freeze in the West Bank and entering talks with the Palestinian Authority. This is a far cry from the blind faith that some in the U.S. foreign policy establishment have in the idea that the 2002 Saudi peace initiative is a game-changer. In theory, that plan called for complete Arab recognition for Israel in exchange for a complete withdrawal to the pre-1967 lines. But what the Arab states are offering may actually be a way for them to sideline the Palestinians and avoid dead-end peace talks rather than to jumpstart them. The Saudis understand that no matter how much money they give the Palestinians, any negotiation that depends on the Fatah and Hamas movements being willing to recognise the legitimacy of a Jewish state and ending the conflict will ultimately founder. Nor are Sunni nations thrilled with the idea of creating yet another unstable Arab state that might fall under the influence of Islamist terrorists and/or the Iranians. What they may really want is not so much the real estate deal of the century that Trump dreams about, but an effort to keep the conflict under control. That’s why the Saudis are asking for a lot less from Israel than the peace processors thought. Like Netanyahu, they may want to manage an unsolvable conflict rather than a pyrrhic quest to end it. Israel has good reason to do what it can to work with the Saudis. But the idea that the “outside-in” concept will transform Trump into the prince of peace is a pipe dream. Let’s hope the president won’t let his ambition to achieve a deal—one that must await a sea change in Palestinian political culture that is nowhere in sight—get in the way of a less grandiose effort that makes sense.